Pneumatic conveying is a simple concept. How do I transfer product from point A to point B? Though it’s simple, trouble shooting them can sometimes seem like a daunting task. We will attempt to break down the four main areas of any conveying system: what factors indicate a problem and what to check for. The four pieces to every pneumatic conveying system are; a blower package, a convey line, a filter receiver/bin vent and a rotary airlock valve. Common issues are product build up in convey lines or airlock valve, erratic feed rates, wear on elbows and or airlocks, and increasing frequency of lines plugging up. 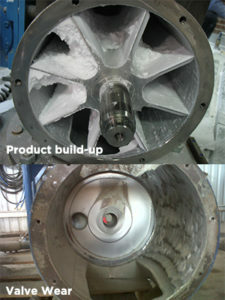 Blower packages represent about 1% of the problems in the field (as long as they are sized properly). In reality, if a blower package runs for the first week of installation it will usually run for the next twenty years if it’s properly maintained. 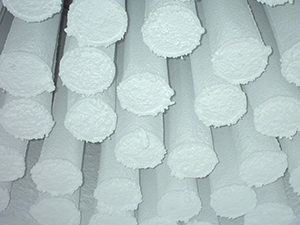 They are the “workhorse” of pneumatic conveying systems. Sure belts will glaze and break from time to time but your speeds should never change and pressure relief valves should never open. When troubleshooting, a change in pressure will be the first indicator there is something off in your conveying system. Historical pressure data on the blower package should be the first place you check in your control system, this will be your best indicator of what is going on inside your conveying system. Refer to the chart below to see what indicators reveal certain problems. The next point you want to consider when troubleshooting is your convey lines. They represent about 5% of the problems in the field. The two main issues in convey lines are product wear and line build up. The main wear point in convey lines are the elbows, (also referred to as sweeps). Holes can develop causing a leak when handling abrasive products. When a hole develops in an elbow it can start off very small, roughly the size of a pen head, and slowly increase in size. Once this happens you will begin to see product escaping from the system. Wear of an elbow can happen in both vacuum and pressure conveying systems. It typically happens near the end of the transfer system, where convey velocities are highest. The second issue in convey lines will be the line plugging due to product build up. Your first indication will be operating pressures are higher than normal. 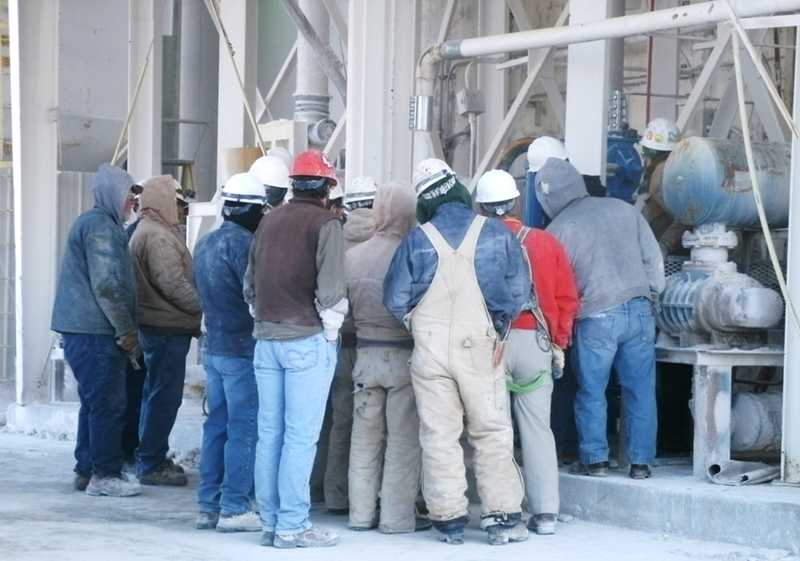 You can also physically inspect your conveying lines and literally “feel” what is going on inside. If you walk up to it you should be able to hear and feel that there is material being transferred, if not you most likely have a plug in your line. When inspecting filter bags remember to check, clean and or replace the filter instrument media so you have a good signal to the timer board of differential pressure. This item is often overlooked when maintaining your filter and is a key component for getting the best data from your controls. The other indicator in your filters/bin vents are the solenoids and diaphragm valves. When the filter pulses for cleaning, each pulse should be a crisp “bark” and sound should be the same. If the pulses sound different you most likely have a bad solenoid or diaphragm column and need to replace them. If you’re tracking with me we still have about 89% to fill in our typical problem barometer. This remaining portion can most likely be attributed to rotary airlocks. Airlocks are a very precision device often put into a rough environment. Depending on the manufacture of the rotary airlock they have different tolerances. In Magnum Systems case, non-high temp rotary valves leave our facility with a tolerance factor of 0.004-0.006 inches, a valve is considered “worn-out” when tolerance between housing and rotor reaches 0.015 inches. Wear on a rotary valve occurs slowly and is all internal which makes it difficult to detect. There is no device to measure or predict wear. Valve wear does not occur evenly or in the same spots. Airlocks are also susceptible to product build up just like convey lines. 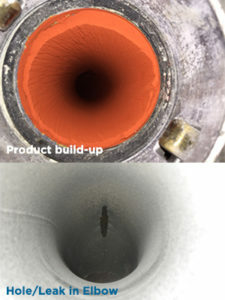 If you have a moist or sticky product the rotary valve will be an inspection point, material will build-up in the rotor pockets or on the bore (interior housing). Below are the indications and issues associated with them. Remember there are four main components in your system that could be the cause of your conveying issues; blower package, convey lines, filter receivers/bin vents and airlocks. Each piece can reveal your potential issues but the best place to start is with the airlock. Need help troubleshooting your system? Need to replace your airlock? Want to replace your entire pneumatic transfer system? Contact Us! Magnum Systems has manufactured pneumatic conveying systems for more than 50 years. Our experienced team members are happy to help trouble shoot your system issues and help provide a solution to keep your line moving.